WASHINGTON – To help ensure that workers have a voice in their workplaces and the protection they deserve, the Occupational Safety and Health Administration unveiled yesterday a new version of its “Job Safety and Health – It’s The Law!” poster. The revised notice was finalized in the evening of Workers’ Memorial Day 2015 which honors the men and women throughout the world who were injured or died on the job. This international day of remembrance and action is held annually on April 28, the date when Congress passed the Occupational Safety and Health Act of 1970 which promises every worker the right to a safe job. 45 years later, a newly revised poster was released to better inform workers of their rights, and employers of their responsibilities. 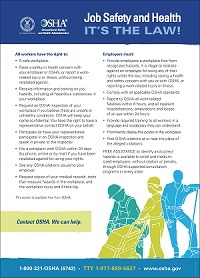 The newly designed poster informs workers of their right to request an OSHA inspection of their workplaces, receive information and training on job hazards, report a work-related injury or illness, and raise safety and health concerns with their employer or OSHA without being retaliated against. 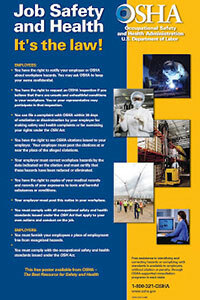 The poster informs employers of their legal obligation to provide a safe workplace. In addition, it has been updated to include the new reporting obligations for employers,who must now report every fatality and every hospitalization, amputation and loss of an eye. It also informs employers of their responsibilities to train all workers in a language and vocabulary they can understand, comply with OSHA standards, and post citations at or near the place of an alleged violation. Over the agency’s 44-year history, there have been several versions of the official OSHA poster, with the last significant update published in 2007. Employers must display the poster in a conspicuous place where workers can see it. Under the Occupational Safety and Health Act of 1970, employers are responsible for providing safe and healthful workplaces for their employees. OSHA’s role is to ensure these conditions for America’s working men and women by setting and enforcing standards, and providing training, education and assistance. Contractors and subcontractors must pay laborers and mechanics employed directly upon the site of the work at least the locally prevailing wages (including fringe benefits), listed in the Davis-Bacon wage determination in the contract, for the work performed. Davis-Bacon labor standards clauses must be included in covered contracts. Contractors and subcontractors are required to pay covered workers weekly and submit weekly certified payroll records to the contracting agency. They are also required to post the applicable Davis-Bacon wage determination with the Davis-Bacon poster (WH-1321) on the job site in a prominent and accessible place where they can be easily seen by the workers. Davis-Bacon wage determinations are published on the Wage Determinations On Line (WDOL) website for contracting agencies to incorporate them into covered contracts. The “prevailing wages” are determined based on wages paid to various classes of laborers and mechanics employed on specific types of construction projects in an area. Guidance on determining the type of construction is provided in All Agency Memoranda Nos. 130 and 131. On February 12, 2014, President Obama signed Executive Order 13658, “Establishing a Minimum Wage for Contractors,” to raise the minimum wage to $10.10 for workers on Federal construction and service contracts. The President took this executive action because boosting wages lowers turnover and increases morale, and will lead to higher productivity overall. Raising wages will improve the quality and efficiency of services provided to the government. The Executive Order directed the Department of Labor to issue regulations to implement the new Federal contractor minimum wage. The Wage and Hour Division has announced its 2015 Prevailing Wage Seminar Schedule. For more information and to register, please visit the Prevailing Wage Seminar Page. For ease of posting compliance, All In One Poster Company has created a Federal Contractor Poster that contains the following notices below. This poster measures 27 by 39 inches to abide by legal posting size requirements of the notices, and is laminated for protection. This poster is designed to be displayed along with your corresponding separate State Only Poster. With the warmer months fast approaching, plus recent record breaking heat in early 2015, California state officials have approved the new revisions in its Heat Illness Prevention standard in hopes of reducing heat related illness and death. The recent updates, that are set to go into effect on May 1st, implemented a lower heat temperature to trigger a requirement to provide water, rest, and shade for workers, additional requirements to monitor and treat employees taking a rest, and mandatory pre-shift meetings to review high-heat procedures. Exposure to heat can lead to headaches, fatigue and muscle cramps, as well as fainting, seizures and even death. Juliann Sum, the Acting Chief of California’s Division of Occupational Safety and Health (Cal/OSHA) advised that heat illness can easily be prevented. California’s construction and farming industries are most susceptible to workers experiencing heat illnesses specially during the hot summer months when temperatures regularly exceed 90 degrees Fahrenheit. Employers shall provide enough fresh water so that each employee can drink at least 1 quart per hour. Employers must provide access to shade for at least 5 minutes of rest when an employee believes he or she needs a preventative rest period. The recent changes also added a 10-minute mandatory recovery period to be taken every 2 hours during times of high heat, or when temperatures reach 95 degrees Fahrenheit. Emergency response procedures was also given emphasis as part of the recent update to ensure aid is provided at the soonest time possible. Acclimatization provisions were also added which require supervision to ensure proper adjustment to sudden weather changes. In addition to the provisions above, employers are also ordered to develop and implement a written plan for complying with the heat illness prevention standard. Heat illness prevention programs are encouraged to be integrated into an employers Injury and Illness Prevention Program (IIPPs) required by section 3203. Cal/OSHA maintains the following field office in California and can be reached at the phone number listed. 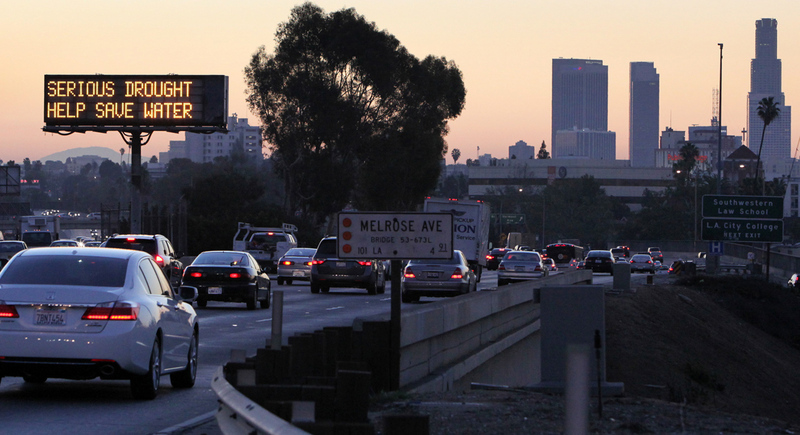 Morning traffic makes its way toward downtown Los Angeles along the Hollywood Freeway, past an electronic sign warning of severe drought. California Gov. Jerry Brown introduced the state’s first mandatory water reduction measure this week last week. 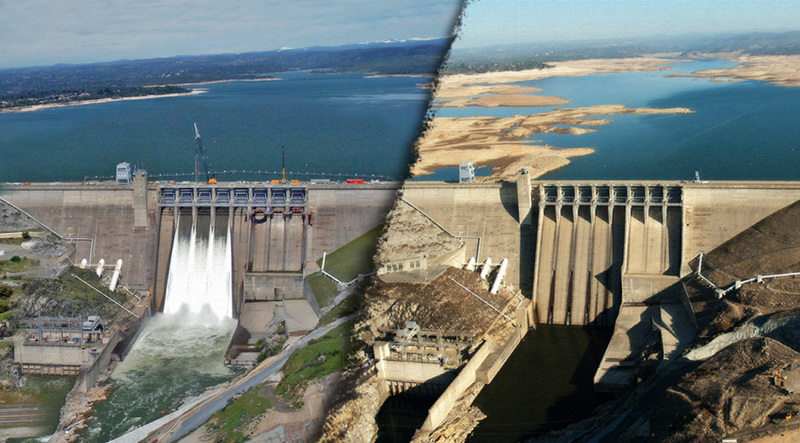 California Governor Jerry Brown has placed mandatory water-usage reductions for the state of California in an executive order signed April 1st, 2015. 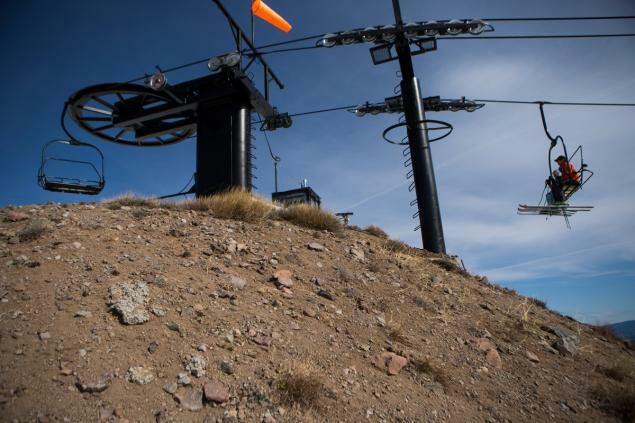 This is the first time in the state’s history that such restrictions have been placed, as the 4-year drought has now hit never-before-seen proportions. Record low snowfall this past winter places the state in a near-crisis situation. The State Water Resources Control Board has been directed by the executive order to enforce the water supply agencies in the state to reduce water usage by 25% over the next year. These agencies provide water for about 90% of residents. The water agencies will be responsible for setting the restrictions, as well as monitoring and compliance. On the other hand, owners of large farms will not fall under the 25% reduction requirement. Officials have analyzed that these farms already have cut back their water use, and they obtain water from sources outside of the local water agencies. However, as required by the executive order, the large farms must create detailed reports breaking down their water use, which will serve as a way to note any water waste. State officials are prepared to enforce measures such as fines to make sure state residents remain compliant. An awareness campaign became more aggressive last year after another dry winter. In August of last year, The Daily Currant posted a story headlined “California Fining ‘Ice Bucket Challenge’ Participants for Wasting Water,” which made its way through social media and was picked up by various outlets before some realized the story was satirical. 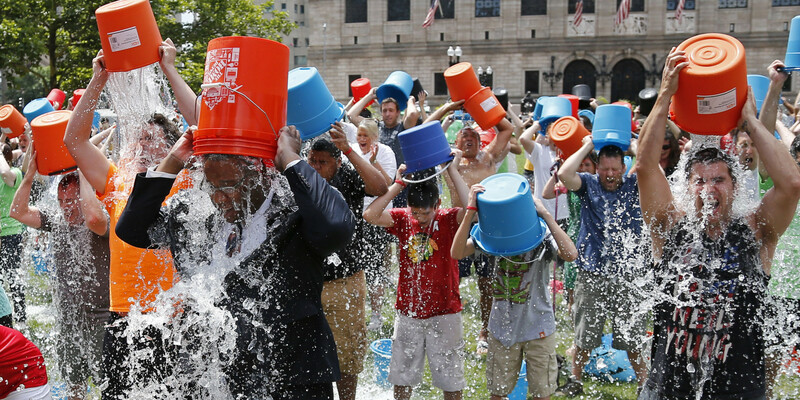 Ice Bucket Challenge criticized as wasteful during California drought. “Let’s do another Ice Bucket Challenge to raise money & awareness for the California Drought. #IceBucketChallenge #droughtshaming #irony,” one twitter user said Monday. See the executive order here. 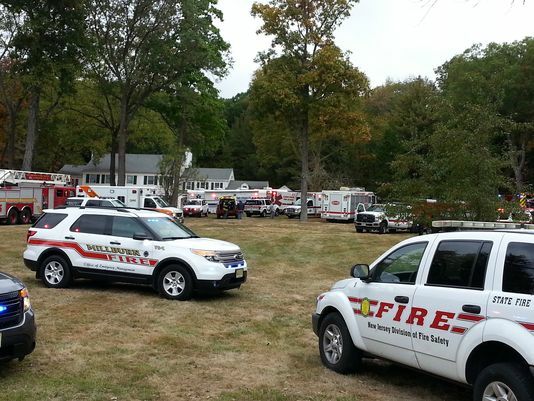 The Occupational Safety and Health Administration has fined a township company in New Jersey $77,000 after investigating a ditch collapse at a Rockaway Valley Road home that claimed the lives of two workers last October. OSHA announced it has found that trench employees were working for Bednar Landscape Services Inc. lacked cave-in protection, leading to the death of two workers. As a result, the landscaping and excavating company has been cited for one willful and nine serious safety violations. Bednar employees Oscar Portillo, 46, and Selvin Zelaya, 39, were two of four men working in the approximately 9- to 13-foot-deep ditch at a residence on Rockaway Valley Road in Boonton installing a French drain pipe when the walls collapsed. One of the two became trapped and the other jumped in to try and save him; both Portillo and Zelaya were soon under about 10 feet of dirt. A third man was not injured and a fourth managed to escape as the wall collapsed. The willful citation was due to the trench not being adequately sloped, protected by shields, or shoring. The serious violations included not providing a ladder in the trench every 25 feet to allow safe exit, not having a competent person inspect the trench, and failures to have utilities marked out, provide head protection, and train workers on the hazards of the chemicals with which they worked. The full citation can be viewed at http://www.osha.gov/ooc/citations/Bednar-Landscape-Services-Inc_998237_0327_15.pdf. April Fooling aside, beginning today April 1, 2015, Wal-Mart will be giving their lowest paid employees a raise to $9 an hour. Following this, employees will see yet another increase to $10 an hour in February of 2016. Overall, over half a million Wal-Mart employees will be affected by the wage increase. In a blog posted on their store website, Chief Executive Officer Doug McMillon cites the reason for the raise as an act of benevolence, stating that Wal-Mart focuses on the potential of their employees. According to McMillon, the company strives to set their employees out for success. Nevertheless, from an economics standpoint, there are a couple different reasons why Wal-Mart decided now to increase the wages for their lowest paid employees. Many labor unions have criticized Wal-Mart for underpaying their employees across the nation. While the company argues that their full-time hourly wage is $12.92, this excludes all employees who work part-time because their hours have been cut. In addition, over 30,000 part-time employees of Wal-Mart recently had their insurance benefits cut. According to Bloomberg News, low-paid Wal-Mart employees receive approximately $2.66 billion in government aid each year. In addition, overall economic recovery over the past few years has decreased the unemployment rate while subsequently increasing the number of jobs. Companies across the country have realized the need to increase wages in order to decrease employee turnover; to keep their best employees, as well as to attract more qualified ones too. With this mindset, it is clear that Wal-Mart’s wage increase may not be a unique one, as other retailers will follow suit to keep in line with the demands of the economy. A huge victory for Seattle Minimum Wage Earners as they see a significant increase in their paychecks beginning April Fools Day 2015. Despite their efforts, Seattle franchises were not able to win against minimum wage employees. U.S District Judge Richard Jones declined the franchises’ request to prevent measures on the minimum wage law. Effective today, April 1, 2015, minimum wage employees in Seattle will see their pay increase from $9.47 to $11 per hour. The franchises were claiming that being required to raise wages at a faster pace than small businesses puts them at risk of going out of business. The judge rejected their argument, stating that no actual evidence exists of the alleged negative impact. 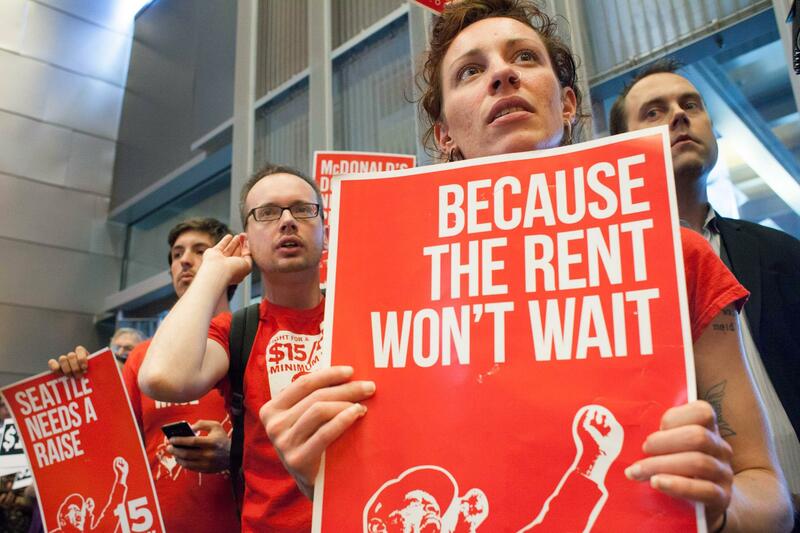 Approximately 19,000 workers in Seattle will be affected by the minimum wage increase. The plan to raise the city’s minimum wage to $15 an hour by 2017 was approved last year. Businesses with fewer than 500 employees will have until 2021 to meet the $15 per hour requirement. Seattle Mayor Ed Murray was in support of the ruling, claiming a large victory for fast food workers who have been consistently pushing for higher wages. In previous articles, we have discussed the continuing prominence of minimum wage increase across the nation. These trends highlight the importance of staying informed on all possible changes or ordinances passed in your business’ locality. Managing a business provides a myriad of difficulties, and constantly utilizing extra time to research compliance matters can be detrimental to a business owner. Let All In One Posters do the researching for you. The knowledgeable and experienced staff can assist you with all your labor law and compliance concerns, while also providing the most professional and accurate posters for your workplace.